Elegant formal written language isn’t the only form of language that matters. Language is a many-faceted thing. Slang and dialect, jocular play with non-standard forms, teen-speak, text-speak, corporate jargon, political waffle and all the other kinds of language typically loathed by the letter-to-the-editor type have their places. These forms are not a threat to language’s health. Their persistence shows that they fill a need. Not all language is well behaved, nor does it need to be. Scientists have never found a language that has fallen to pieces. It’s not in language’s nature. Humans need it to do too many important things. Talk on the Wild Side is not just another corrective to misguided ‘corrections’. It looks at many different efforts to engineer language. Seven essay-like chapters delve into ways that would-be improvers have sought to tame or fix language. One explores how languages change over time, lopping off bits of words and then fusing bits together again – to no ultimate harm. A brief history of machine translation shows how efforts to automate translation with algorithms were doomed by their very premise. If sounds and words are part of the system, grammar is the system. And many people are convinced that grammar is in decline. Happily, this is bunk. Thought isn’t language, language isn’t just grammar, grammar isn’t usually what the hardiest of grouches think it should be. 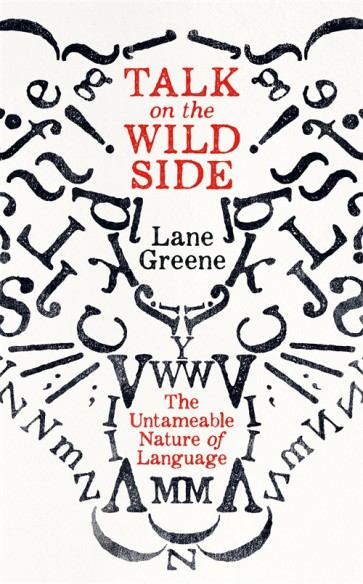 Talk on the Wild Side: The Untameable Nature of Language is thoroughly recommended – to language fans, critics, educators, and learners – for its good sense, admirable attitude, and thoughtful commentary on the nature of language and the infinitely varied and complicated ways we use it. It’s available from the publisher at the link above or from your preferred bookstore. And how great is that cover art by Sinem Erkas? This entry was posted on Friday, September 21st, 2018 at 3:04 pm and is filed under book reviews, books, language, usage, writing. You can follow any responses to this entry through the RSS 2.0 feed. You can leave a response, or trackback from your own site. Does Greene discuss Sapir and Whorf on linguistic relativism, Daniel Everett on the Piraha, etc? Such thinkers, as with Lakoff, touch upon deeper levels of language and the power it has over our minds, specifically in its relationship to culture. That would directly relate to why language is untameable, as it can never be made into an object held at arm’s length. Language is at the core of our identity and experience of reality. Yes, he discusses linguistic relativism, particular the ‘folk-Whorfian’ belief held by some sticklers that careless or illogical use of language leads to careless or illogical thought. I think our core experience of reality transcends language, FWIW. I’d make a few points. What might be called ‘folk-Whorfian’ belief probably has little to do with what Whorf advocated. Whorf, in line with Sapir, certainly wasn’t making an argument for language being rational or proposing that language should be made more rational. It is actually rationalists in the linguistic field who have most strongly opposed linguistic relativism because of its focus on culture (e.g., Noam Chomsky wanting to make linguistics a hard science, in his arguing for a computational model of the brain and in his dismissing social science and field studies). As far as that goes, what gets called the Sapir-Whorf hypothesis isn’t specifically based on the writings of Sapir and Whorf. Neither Sapir nor Whorf believed in linguistic determinism, what gets wrongly called the strong Sapir-Whorf hypothesis — as both also did research on universal aspects of language such as sound. There has been a longstanding confusion between and conflation of linguistic relativism and linguistic determinism. The two are separate hypotheses. But for some reason the confusion and conflation persists, maybe because few critics bother to go back to the original texts to see the full context of their arguments. Another thing is that, though Sapir and Whorf were not linguistic determinists, recent research has found some cases of linguistic determinism. One example is the lack of complex numerical system in the Piraha language and the accompanying severe difficulty they have in counting, even when others have tried to teach them — as psychologist Peter Gordon, in testing them, concluded: “represents a rare and perhaps unique case for strong linguistic determinism.” Humans, as with some other animals, have an innate ability to distinguish up to the number three. But beyond that, linguistic concepts are absolutely necessary. Still, as Sapir and Whorf argued, most language seems to operate primarily through shaping and influencing (not determining) thought, perception and behavior. Recent decades of research have strongly confirmed this view. The debate about linguistic relativism is over. The evidence, having been limited in the past, has now become overwhelming. The only question remaining is how far does it go. At some point, it begins to touch on more philosophical issues that linguists as of yet don’t know how to tackle, such as issues about claims of ‘reality’ which touches upon many other theories like social constructivism, embodied embedded cognition, etc. I know you’ve written about Daniel Everett’s first book. But have you read his later books (Language: The Cultural Tool, Dark Matter of the Mind, & How Language Began) where he goes into greater detail about language and culture? And have you read the work of his son, Caleb Everett (Linguistic Relativity & Numbers)? Beyond the Everett family, have you checked out other recent books surveying the field such as Linguistic Relativities by John Leavitt and the Language Myth by Vyvyan Evans? In my browsing of language-related websites and blogs, I stumbled across one which was dedicated to complaining about other people’s grammar. Some of the examples were by journalists no doubt cutting and pasting no doubt shortly before a deadline. Others were genuine varieties of English; they just happened not to be her variety of English. The only good thing I can say about it is that she stopped posting about six years ago. Fair enough, on my blog, I sometimes post about other people’s mistakes or variations, but always with a discussion of what makes it a mistake or variation. When I first started blogging about language, there seemed to be a lot of those kinds of blogs, whose chief purpose was to showcase and often ridicule errors in usage. Issues of manners and privilege didn’t seem to cross their creators’ minds: too busy playing ‘gotcha’. It would be nice to think we live in slightly more enlightened times now, grammar-wise, but it’s more likely those blogs faded for the same reasons other, better blogs did in the same period. I consider your discussions of errors to be in an entirely different category, because they come from a place of interest and education. The book sounds very interesting and I will track it down later. My initial comment arises from a word in the subtitle: ‘untameable’. I first thought that you had made an error, as I assumed it would be ‘untamable’, but I know that you are an editor and would probably take care with something like that, and the picture of the cover further down proved that you copied correctly. (It is disappointing to see book catalogues and other discussions of books where the title in the text is misspelled compared to the image of the book right next to it.) Nonetheless, I then thought that the subtitle of the book was misspelled, but that seemed even less likely. I’ve now checked and found that both ‘untameable’ and ‘untamable’ are spellings in use. I will have to do more investigation, as I thought that the silent E was always dropped (eg ‘hope’, ‘hoping’), unless it was necessary to prevent confusion (eg ‘die’, ‘dying’ v ‘dye’, ‘dyeing’) or to guide pronunciation (eg ‘service’, ‘serviceable’).Things are not as simple as I thought. I hope you enjoy it. A quick look at the Google Books corpus shows that untamable overtook untameable in the 1860s, but there’s not a lot between them now. Nameable, by contrast, has long had the edge over namable. Both e-less and e-full spellings are listed in the OED and can be considered standard, but tendencies and preferences will vary from one time or place to another. Here’s a publisher’s spelling horror, while we’re on the subject. One question: If you’re not interested in the tired old prescriptivism-descriptivism debate and the tedium of English-language linguistic peevery, is this work worth reading? Does it have anything besides the old ‘language is always changing’ and ‘language is alive’ mantras, or the observation that language should always fit the situation? I think it is worth reading even if that terrain is familiar. Greene also covers a good deal more (e.g., invented languages, machine translation), all of it in a constructive and entertaining fashion. His recent essay at Aeon may help you decide: it summarises the book’s main argument and gives an idea of its style. Greene’s article is interesting, but more for its examples than its arguments. I have come to my own conclusion: prescriptivism is a subset of descriptivism (that is, prescriptive rules can be ‘described’ as part of the greater whole). And yes, I am a prescriptivist myself when I see words like ‘fulsome’ being used by people who rather sloppily conclude that it must mean something like ‘full’, or people who use ‘advocate for’ when ‘advocate’ is fine. But these are the results of ignorance, not semantic or grammatical shift as Greene would have us believe. I also realise that it is probably futile to fight against them in the long run. But the entire debate is so stultifying and predictable (as Greene shows) that I find it intellectually boring. While it’s easy to become impassioned about the curse of prescriptivism in English, the obsession with minutiae is tiresome and all too often misses the larger picture — for instance, how well are schools teaching children to produce standard written English or to spell according to the accepted orthography? Producing literate citizens (even if they love and continue to use slang and colloquialisms and follow linguistic change) seems to me to be an worthy goal of education. I am studying languages like Japanese, Chinese, and Mongolian, which have rather different dynamics from English, and looking at languages like these makes you realise just how narrowly framed the debate has come to be. So, no, I don’t find Lorne very refreshing and no, I don’t see his contention that you have to belong to one camp or another very convincing. The prescriptive-descriptive mentality is not going to change; indeed it seems to have become more firmly entrenched. But while it is going to continue to cause widespread gnashing of teeth for a long time (since English is currently the world’s dominant language), it is interesting more as a mentality than as an issue of compelling linguistic interest. Even readers (over)familiar with the arguments will find plenty to enjoy in Greene’s book, but I won’t try to talk you into reading it if you feel it’s not for you. He would certainly agree about the value of learning a form of standard English, as would I. The debate over prescriptivism and descriptivism is often tedious and wrong-headed – though even then it can be a useful point from which to explore related political, social, and psychological matters. I would not, however, claim that anyone using fulsome to mean something like ‘full’ are being sloppy; after all, this was the word’s original sense and has long been in popular use. That post may serve as an example of how prescriptivism and descriptivism can overlap; reconciling descriptivism and (prescriptive) copy-editing, which is my day job, is a topic I addressed more explicitly here.